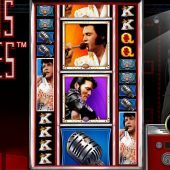 Elvis Lives slot must not be confused with WMS' other slot Elvis The King Lives or the discontinued Elvis A Little More Action slot by IGT. Many of these have come and gone over the years, some better than others. Elvis is an appropriate theme considering he was the resident performer at Caesar's in Las Vegas for years, the home of gambling and true to form we get some music with no vocals as we spin here. The reels contain various depictions of Elvis too along with stage props and they sit over a darkened stage where he appears yet again as in case you didn't get it, the game has an Elvis theme. So can we leave this concert with our bankroll all shook up, or will it go way on down? Alas I had a sinking feeling when I saw Elvis Lives slot because is has 5 super reels of 12 rows each which lately from WMS has spelled low-potential, lots of pay lines and dreadfully low line pays to compensate for them. Sadly, I was right and it's likely we'll have another Kronos Unleashed or Forbidden Dragons here, but let's check the 5-of-a-kind pays and see. There are 60 lines and the icons are all stacked bar the Wild and there are 3 different images of Elvis which along with the Wild and Game Logo all pay an enormous 2x bet for 5, another 4 picture symbols of Microphone, Sunglasses, Rose and Buckle paying 0.8x and 3 card values at 0.5x. I told ya! The reels 2, 3 and 4 can randomly spin as a series of colossal 3x3 symbols including Wilds. Very unremarkable considering the tiny pays, but on this 3x3 reel when it occurs you can see 4 different 3x3 scatters which when landing in view trigger their respective bonus games. Aloha Free spins - 7 free games, with Wandering Stacked Wild and Wandering Stacked Double Wild both 3 rows high on them. The latter doubles line pays and at least one is present during the first spin. This will stay on the reels and move about and it's possible more can land, although the 2x ones do not multiply each other. No retriggers. TCB Spins - 5 free games in which Wilds turn to green, pink or blue rings and seeing 3 of them in any spin will multiply wins by 2, 3 or 5x respectively. If a set of 3 of two or three colours land together the multipliers are the product, so up to 30x is possible. No retriggers but extra spins if the ES tile lands on reel 5, 1 is awarded. If a multiplier is in play then you get that amount of extra spins, i.e. 2, 3 or 5. Jumpsuit Picker - 3 picks awarded for cash values of 1/50 x bet (yes one fiftieth!) to 5x bet. Piles of gems are there with these values. Get 7 to move to level 2 where the lowest value is still a fiftieth x bet, but the highest rises to 15x. 12 gems in total will get you to level 3 where the best is 20x bet. If after level 3 you have collected 18 gems, you get a jackpot of 500x bet. 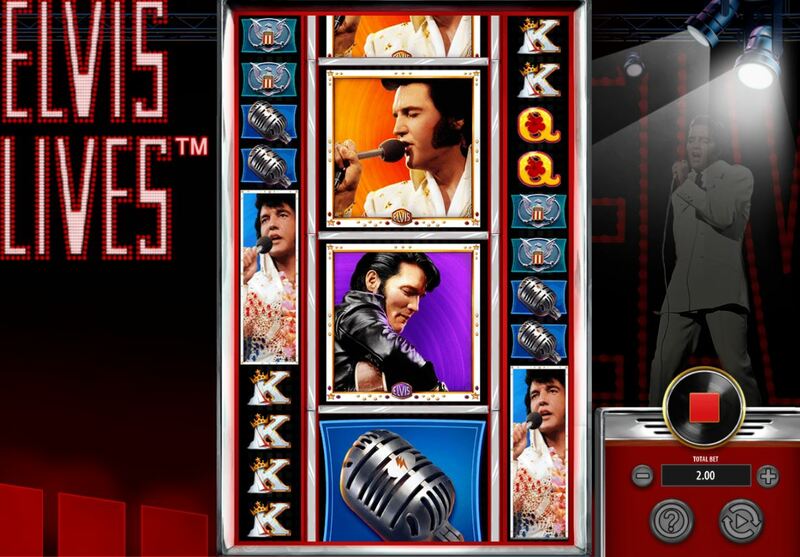 Elvis Lives Bonus - you play on a giant symbol grid with huge E-L-V-I-S letters on the reel. As you will be aware, Elvis is an anagram of Lives so you spin until you collect a letter that can't fit into the ELVIS LIVES display i.e. a third one of the same letter. You have a scale of 1x for just 2 letters to 128x bet for 9 letters and if you get all 10 then you get a 2000x jackpot. Good luck with that one!